My last CGD activity before heading off on holidays this week was a talk given by Carole Riley, SAG Councillor and Professional Genealogist, on NSW Land Records. Although I have attended talks by three different people on this tricky topic I am still a novice. Excellent advice came from the SAG volunteer who thanked Carole. This lady suggested that, to make sense of all the information Carole had presented, we should not put off going to the NSW Land and Property Information Dpeartment (commonly known as the Lands Department) but should do so whilst the content of the seminar was fresh in our minds. She suggested that we arm ourselves with Carole's comprehensive notes and make the visit. So that I can shed my novice status I might just have to bite the bullet and make that excursion. Whenever I am able I tune in to Geneabloggers Blogtalk Radio hosted by Thomas MacEntee. When Thomas isn't available DearMyrtle takes the reins as presenter as was the case last Saturday (Friday evening in the US). I was listening to the program with some GeniMates at SAG when Myrt moved on to a regular part of the program in which a Geneablogger is honoured. I was thrilled that Myrt's selection last week was the Geniaus blog. She made particular mention of one of the tabs on this blog, My CGD Learning Log, where I record my learning journey. As a former educator I have a commitment to lifelong learning and use this page to record my Continuing Genealogical Development. To receive positive reinforcement in the form of blog comments or a compliment from a fellow genealogist always gives one a boost. To receive a public commendation from someone of Myrt's standing in the genealogy world was phenomenal, Myrt's kind words and recognition catapulted me up to cloud nine. DearMyrtle, thank you so much for the shout out, it was fantastic to have an Australian blogger honoured in an international forum. That the blogger was yours truly made that recognition even sweeter. I clipped the following excerpt from the Society of Genealogists latest e-news. With the strong Aussie dollar this offer represents good value. The Society of Genealogists' Summer Membership Special Offer waives the joining administration fee of £10 until 30 September 2011. This means your first year’s membership is only £45 (or £27 for overseas members). Join the Society of Genealogists today and your discounted membership will be valid until October 2012. IN ADDITION the Society’s Summer membership Offer includes free Family Tree Builder genealogy software (while stocks last). There may only be a few posts from Geniaus over the next few weeks as she is taking a break and having a little holiday. Today's activity is a visit to The National Archives at Kew where I will be looking at some original documents relating to my 12 convict ancestors. I made a short visit to the Archives yesterday where I got my Reader's Ticket and ordered a couple of Surgeon's journals for my convict ancestors' journeys to Australia in the early 1800's. I am looking forward to having a cuppa with Audrey Collins, Family History expert at the Archives. My main frustration with Twitter, Facebook and now Google+ is that my feeds/streams become clogged with irrelevant (to me) twaddle. I had hoped with the potential of Google+ to easily pigeonhole people into multiple circles that some more thoughtful sharing of messages might occur. I have circles for Android, Australians, Family, Friends, Education, Genealogy, Libraries and Strangers. I am so pleased that I have been able to connect with a number of genealogists that I have met online and know by reputation. These people I just pop into the genealogy circle and try to post into their streams only things that can be related to genealogy. Other genealogists with whom I have a more personal relationship I have also added to my friends circle so they can hear my news of new babies, great meals, frustrations with my elderly mother and weather reports. I do not share Android news with all genealogists, many of whom are Mac disciples, as I am not into conversion but collaboration with folk with a shared interest. Google+ allows us to share but it also gives us the ability to share judiciously and easily. I am concerned that as Google+ grows its potential for real collaboration will suffer because people are not thinking before they post. Whether we are writing fiction, a blog post, a science report or a news article one of the first things we must do before putting pen to paper is to identify and think about our audience. If we apply that to our use of Google+ we will have a powerful tool. Thanks for your Christmas in July present. I have had lots of fun playing with my new toy and, like a good girl, have been sharing it with my friends, I've even asked people I barely know to play with me. In fact I have shared it with 179 of my friends. I like it so much that I even take it to bed with me and my mate, Android. I could think of more things, Santa, but I'm not a greedy girl. I know Mr Google is very busy, Santa, but my friends and I would be very happy if you could take these requests to him. We promise that we will be good boys and girls and not mess with our new toy, Google+. Geoff Cannon reports that his wife says he always has either a map or beer in his hand. At this morning's meeting of The Hawkesbury Family History Group Geoff Cannon from Maitland NSW spoke of his love affair with NSW maps and of the work that is a result of this liaison. Geoff kept the huge audience enthralled as he shared his knowledge of County and Parish maps in NSW. With his casual and down to earth approach he made a difficult topic enjoyable and easy to comprehend. Geoff's work started many years ago with a plan map of Maitland in the Hunter region in NSW. He then procured all of the parish and town/village maps for that County. Geoff compiled on cards an index that listed the original titleholders of every land grant in the County. Once he finished Geoff moved on to the neighbouring counties and Sydney, purchasing and indexing all of those maps. He plans to index 19 counties and anticipates publishing the last instalment of his work within five years. 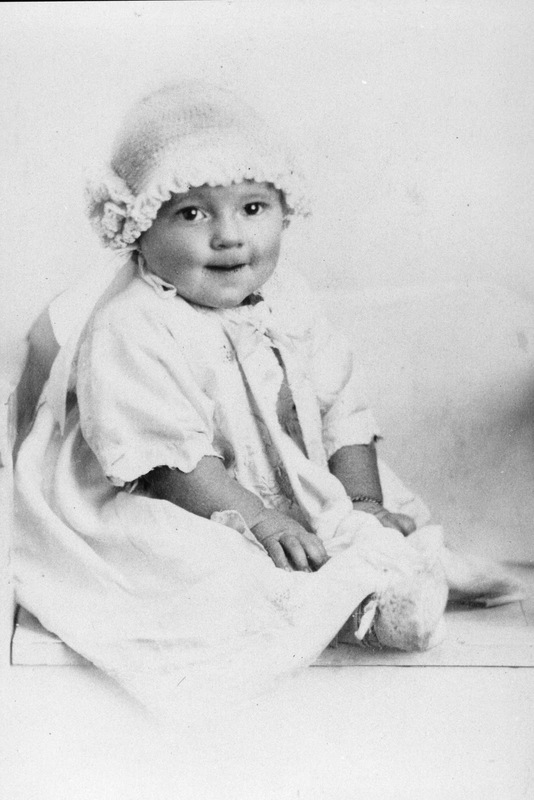 After attending a technology Conference of the Royal Australian Historical Society in Wollongong Geoff applied and was successful in gaining a grant to help him publish his work. His first work published 1997 was the result of 20 years research. He has since published further indexes on CD and in print. A listing of Geoff's publications and where they can be found in Australian libraries is on the Trove website. After speaking about his work Geoff turned his attention to the Parish of St Matthew that includes Windsor, home of The Hawkesbury Family History Group and shared information about the first landholders in that area with the group. He indicated that before 1800 there had been 39 recorded grants in the Parish of St Matthew. 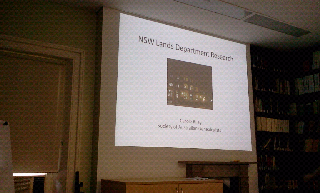 Geoff finished his talk with a poem by John Dunmore Laing about place names in NSW. I wish I would have asked for a copy of this, I will seek it out and share it via this blog when found. I have only been to two meetings of this group so far and have thoroughly enjoyed the presentations by Geoff today and Karen Rogers last month. I am sorry that I will not be able to hear next month's presentation by Cassie Mercer from Inside History Magazine. Postscript: I had intended this for the GeniAusEvents blog but selected the wrong optin to post. Now that it's here it may as well stay. I just noticed on a listserv that a new book of interest to genealogists is to be launched on July 31st. If you have a connection to any Police attached to Windsor Police Station between 1862 and 2010 you might be interested in the book "Leaving the Barracks" by Heather Smith. Seems like yesterday but it is around nine years since I last visited The National Archives (UK) in Kew. I have been to the UK on a few occasions since but because Mr Geniaus isn't too keen on genealogy research I haven't made it to Kew again. By hook or by crook I was determined to get to Kew on my forthcoming trip. When Mr Geniaus indicated that he'd like to attend the cricket at Lords some time I planned our London visit to coincide with a cricket test match -that's him sorted.As our ancestors are English, Scottish and Irish The National Archives holds quite a few resources of interest to me. Mr Geniaus is always interested in what I find - he just doesn't enjoy the hunt. Next step was accommodation - I have booked a hotel that is only a few minutes drive from TNA. Now I must plan to maximise the time I spend at the archives. I have already read their excellent guides on the Visit Us Page and noted the various rules and regulations so that I do not blot my copybook. I've downloaded a copy of their guide and map to help you find your way around onto my netbook and tablet. I see that I cannot use a scanner in the Archives so am leaving my Flip-Pal in Australia and will rely on my digital camera and the camera stands provided by the archives to take images of resources. I have the required forms of identification ready for my Reader's Ticket application. My pencils are packed and I have a copy of my database on FamilyBee on my Android tablet, TMG on my netbook and my Geniaus Family site - I should be able to access my tree from the Archives! I have drawn up a list of my direct convict ancestors and the names of the ships on which they journeyed to Australia. The high spot of my last visit to the Archives was holding in my gloved hands the original surgeon's journal from Patrick Curry's trip to Australia on the Hooghley. I got goosebumps when I read the entries noting his problems with scurvy. I was so overcome that I didn't take good notes that day. As well as taking another look at this document I will try to get access to the other 6 surgeons' journals that I have found in the TNA Catalogue for my 12 convicts. Similarly I need to make a list of the immigrant ships of our free settler ancestors to see if I can find any records of their journeys. Mr Geniaus' ancestor, James Ball, was a deserter from HMS Forte before he made his way to join his family in Australia. Another of today's jobs is to see if I can identify some records that may have information on James' Navy service. I'll also try my luck with "Places, prominent people & subjects" searches for .ncestral villages and ancestors' names. The fantastic "Looking for a Person" page gives me with lots of memory joggers for places where I might find pertinent info on the ancestors. By the end of this week I hope to be armed with details of more documents to consult than I will be able to see during my two (maybe I can stretch it to three) days at the Archives. As well as seeking ancestors I will be meeting up with a living treasuere at the Archives. I am having a break for a cuppa with Audrey Collins, Family History Records Specialist at the Archives. I met the bright, bubbly and knowledgeable Audrey at Rootstech 2011 and look forward to seeing her there in 2012. If you've been to Kew lately and have any tips for a fruitful visit I'd love to hear them. I was privileged this week to be invited to take part in a forum in which users of The State Library of New South Wales were asked to comment on a set of questions posed by an independent consultant each day. I commend the Library on going out to its membership and seeking their opinions on their services. The terms of the forum prevent me from sharing the questions asked or the comments made. I can say that there appeared to be a range of respondents from librarians, to international students, a few genealogists,city and country folk, people with postgraduate qualifications and tose with little formal education. I recognised the Presidnet of a NSW family history society and a fellow member of SAG. I was one of ten forum members who received a prize of a $20 voucher for my contributions. Thank you to The State Library of New South Wales for allowing me to submit my 4,584 opinionated words to the forum. Is it any wonder that I didn't get much blogging done last week? Arriving at my second monthly meeting of The Family History Group at The Ku-Ring-Gai Historical Society last week I felt that I belonged as a number of the people I had previously met greeted me warmly. There was also waiting for me a name badge. Jo Harris, Vice-President and Family History Leader, capably lead the morning's workshop in which she demonstrated the new resources on the Society's intranet. Made available for $5 was a multipage listing of the resources on the intranet, I declined to purchase this as it was only available in hard copy but I am sure that it will be a valuable resource for those who like to have paper-based records. On these occasions I find that the incidental things I learn are most valuable. I learnt that Hyde Park Barracks has a database of every convict that spent a night there. One can phone and ask if a particular convict is on this list. One can then request, for a fee, a copy of the database entry. I usually use Abebooks to find copies of old and out of print books to buy, Jo introduced me to Booksandcollectibles another online bookstore. During the lunchbreak I ate my peanut butter sandwiches in the company of Cecilia, whom I hadn't met previously. After lunch we had our formal meeting. I am sorry that I won't be around for the talk on Trove by Ann Manley on August 11th (visitors welcome - contact the Society) but I will be able to attend the Irish research day on 8th October. This active society already has a Mac users interest group and is soon to start up a German interest group. Guest speaker for the afternoon was Gary Luke, a committee member of the Australian Jewish Historical Society, research advisor with the Australian Jewish Genealogical Society and a trustee of the Jewish sections at Rookwood cemetery. Gary spoke on Foreigners and Aliens giving details of Government records about non-British immigrant ancestors. Although I have a boring British/Irish ancestry I found Gary's talk that was richly illustrated with images, quite fascinating. * The Applications to Marry in The Great Synagogue are a valuable and often overlooked resource. In not quite two days I have developed a circle of 22 genealogists on Google+. That's certainly not up to the number I connect with on Facebook and Twitter but is encouraging. I have organised the 43 people in my circles into a number of groups: Australian, Education, Family, Friends, Genealogy and Libraries as these reflect my interests. I had an IT circle but deleted that because everyone in the circles shares an interest in technology and social media. Some people are in one circle, some in more and one is in four circles. ie Australian, Education, Genealogy and Libraries (I wonder who that is, Sharon?). The major benefit this has over my one Twitter account is being able to target my communications to a particular group and not clog up their streams with too much irrelevant stuff. If something from one of my Education mates that will be of interest to my other mates appears in my stream then I can share it appropriately and so on; just as I did this morning with this video about Google+ circles. I have tweaked my public profile so that people looking for contacts with similar interests should be able to find me. Just as with other Social Networks when someone adds me to one of their circles I take a look at who else they have added to seek new contacts. I am pleased that a number of people I invited: Shelley from Twigs of Yore, Tanya Honey, Sharon Brennan, Pru Mitchell, Thomas MacEntee and Amy Coffin accepted my invitations to join. I also found Drew Smith whom I had met at Rootstech 2011 and Tami Glatz whose Relatively Curious blog I follow. I follow Dusty Rhoades and Andrew Kemp on Twitter and now on Google+. Australians Shauna Hicks and Stephen Phillips were members of Google+ before me. Of course, most important, is Banai Feldstein who made it possible for me to join. Members of my family have also joined; I wonder if they will enjoy the genealogy posts I send their way? I have installed the Android Google+ app on my Galaxy tablet. Although I prefer the interface on the desktop I am quite happy to use the tablet. The tablet does have one feature, Huddle, that does not appear to be in the desktop app. Shelley has set up a Huddle for The Galaxy Girls as a tool for us to discuss our tablets and apps. I am finding The Spark function relatively useless at the moment. I have set up a spark for "genealogy" but it is not returning much valuable information. The results when I set up one for "genealogy Australia" were even worse - that returned an article on Miley Cirus and one on Masterchef! One of the features I am finding refreshing is that, for the moment, this tool is focused towards people rather than institutions. I envisage that I will continue to use Twitter to follow organisations and commercial bodies, Facebook to follow friends and organisations who are not so into social networking and Google+ to follow my contacts from genealogy, educations and libraries with an interest in social media. I hope that this venture is successful so, as I did with Google Wave, I am giving it a go. I do have a few invitations to hand out to genealogists who are committed to giving Google+ a rigorous tryout. I am suffering from a severe case of Appitis. Instead of becoming familiar with those apps I already have on my Galaxy Tab I continue to download and test new ones. Since I last wrote on this topic I've read a post by Banai Feldstein, My gTablet -or- Adventures of a New Android OS User, on her experiences I hope that she continues to document them. I have also exchanged a couple of emails with the other Galaxy Girls, Shelley and Tanya, in which we touched on a few apps. I am now following both androidcentral and AndroidSocMedia social media on Twitter and, from their posts, have found a few other apps to try. I am finding that The Galaxy Tab blog tells more about new hardware releases than about how current owners get the most from their gadgets even though it states "We strive to deliver to Galaxy Tab fans insightful and resourceful posts". This blog is on my RSS hit list. I have organised the pages on my tablet into some semblance of order. On the first page I have those things I want close at hand. : Battery Life widget (so I know when to plug in, Calendar, Camera, Contacts, Facebook, Gdocsnote, Gmail, Google+, Google Reader, Google SearchPhone, a couple of browsers (deciding which to keep),Settings, Tweetcaster (Twitter app) and Weather. I am still on the lookout for a better calendar app for this and guess that I'll have to pay to get one. The second page has a number of handy tools that include: Alarm clock, Amazon Kindle app (no need for an ebook reader), Convert Units (temperatures, weights, measures etc), Currency Converter, Dropbox and Sugarsync, Juice Defender (helps prolong battery life), a barcode reader, a couple of GPS apps (don't know which to use yet), QR Droid, Skype, Voice Recorder and World Clock. I tried Skype out with my daughter the other day, we were sitting in the same room with our Galaxys and talking on Skype (no video for our OS), it amused the grandkids to see us playing with our gadgets. Page three is for news and reference and has the apps for local and overseas newpapers and news services, Wikipedia, and telephone directories. Genealogy and games are on page four. I only have two genealogy specific apps to date: BillionGraves that I am anxious to try at a local cemetery when the sun comes out (Shelley from Twigs of Yore tells me that I must let Billion Graves know the names of those cemeteries that I intend to vist a few days before I head off) and FamilyBee that I found useful at my local family history society on the weekend. As for other fun my daughter introduced me to the Wordz game last week and since then I have spent way too much time trying to beat my best score. From recommendations on Twitter I have also added Jewels, Red Stone and TicTacToe ready for my next trip on a plane. I use page five to park those apps that I have yet to test as well as those that came with the gadget from Telstra and that I will never use. The newest app I have is Google+. I prefer the desktop app to the one on Android but I don't think I will have too much difficulty sharing with the people in my genealogy circles when I find them on Google+. The main issue at the moment is, that because there is a limited number of users, I don't have many people with whom I can collaborate. I hope that the Skype app, that worked well at close quarters, will function well in free wifi zones when I next travel overseas so that I can make cheap calls home to the family. My one failure this week was when trying to make a video on the device. I am a demon in that, I don't refer to instructions, I expect everything to be intuitive. I selected the camera, chose video mode and presses the button that I thought would record. Nothing happened. While I think of it I'll go and learn how to do that right now. I'm hoping to hook up with more genealogists on Android - I'd love some comments from you. Thanks to Banai Feldstein, of The Ginger Jewish Genealogist, I received an invitation to Google+. Banai gave her insights on the application in a post, Google+ – My First Thoughts, a couple of days ago. After being on the Google+ site for just an hour I can report that this old girl likes the interface and the ability to categorize people into 'circles' and easily communicate with one, all or some of one's groups. Setting up my profile and applying privacy settings was easy, I appreciated being able to have a preview of my public profile so that I knew what was in the public domain. I am anticipating that I will use this tool for genealogy and have created a genealogy circle for this purpose. At the moment I have found a few genealogists from the US and four from Australia to add to the circle. I think that I have invited a couple of other genies but am not sure if I have the process right. I have also created a circle for my contacts from the world of education so that I can keep up with developments in ICT. Until I get a few more connections I really don't know how I'll use Google+ but I look forward to further exploring its possibilities. Will I be seeing you at Rootstech 2012? My flights are booked so I am definitely going to Rootstech 2012. I know that it is seven months away but, one needs to take advantage of good airfares when they are available. I am not a member of the LDS Church so why am I travelling all the way from Australia to Utah for a three day conference? * I found that the content at Rootstech 2011, that combined technology and genealogy, suited my interests. No event in Australia provides such a range of presentations on this topic area. * There is an opportunity to hear world renowned keynote speakers that don't travel to Australia. * The conference program that caters for a couple of thousand attendees has multiple streams has enormous breadth and depth. * I can meet in person the geneabloggers and geneatweeters with whom I communicate each day. * I will be able to renew the friendships I made with conference attendees in 2011. * There is an opportunity to meet up with the developers of software that I use like Darrin Lythgoe. * The conference represents excellent value with a low registration fee and reasonably priced accommodation right next door the the conference venue. * I get an opportunity to promote Australian genealogy to an international group. * I can use the facilities of The Family History Library with its free access to print and microform resources on open access. I spent two days there this year and only looked at the online and print materials. In 2012 I will concentrate on the microforms. * The air is fresh and crisp in SLC in February - a respite from Sydney's summer humidity. * I can see a bit more of the United States on my way to and from the conference. * I can visit my favourite department store, Macys, and bag a few bargains. Next year I am taking Mr Geniaus along to Salt Lake City with me. Although he has no interest in genealogy research he is interested in his ancestry. As the cost of registration is so reasonable I will be registering him for the conference so that he can attend the social functions and some conference sessions. The Rootstech program is so varied that even he should find something of interest! I took advantage of four visitor-free days this week to empty my genealogy folders/binders and my boxes of filing out of my study. I can hardly move in my study so I took all of this gear to the dining room where I was able to spread it out. Firstly I sorted all the papers, I put each piece in a plastic sleeve then sorted them into abc order by surname. Then the filing frenzy began, this was more difficult than my digital filing episode, Fling it in the folder, a number of weeks ago as the physical folders/binders are cumbersome and the plastic sleeves slippery. I rearranged the contents of some folders to make the distribution of files a bit more even. I now all except a few items that need to be scanned organised in my 44 folders/binders. I have a folder (or two or three) for each member of my immediate family ie, parents, husband, parents and parents-in-law, children and grandchildren. For each surname that warrants it I have a surname folder, the rest of the people are filed in one abc sequence by surname then first name then date of birth (if two or three share the same name). I have additional folders for places, learning materials and correspondence. This organisation mirrors my digital filing system. Three or four years ago when I indicated that I needed to organise my files my husband bought me a labelmaker. I finally opened the packaging on that a couple of days ago and worked out how to operate it; all of my folders now sport clear labels. Just half an hour ago I moved those 44 folders back into my study. I am feeling quite elated that this job that has been hanging over my head for so long and causing me grief has been conquered. If I wasn't home alone I would crack open a bottle of bubbly. Instead I am sharing my joy with you, my GeniMates.